The following error message keeps crashing my ut everytime I go into the uk insta server. Anyone recognise it? And if so, whats the remedy lol? I've cleared cache with no change.. Reinstall required? Last edited by AuSSiE^uK; 07-12-2012 at 07:28 AM. 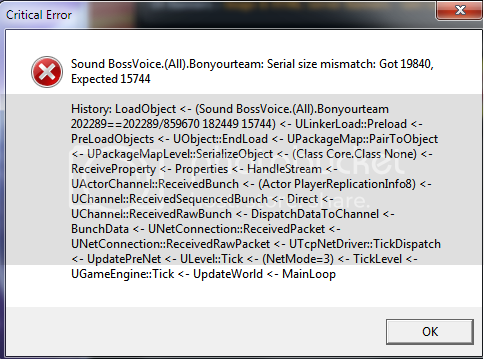 Your boss voice file does not match the one on server. Delete it. The server *should* send you the file. If not you should download the ut package in download section and use the patch only. The patch should restore the voice pack and you can avoid reinstalling and losing your settings.